:: Missed Dr. Chiappino's Autism Teleseminar? Spring looks like it's finally sprung! 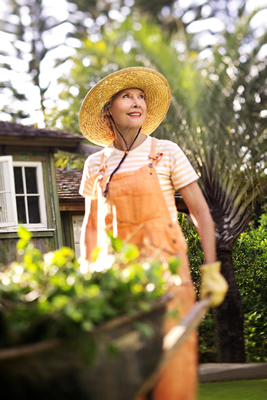 As the weather starts to warm and the flowers and trees begin to bloom, we can finally venture outside for some exercise and soak up some Vitamin D.
For many of us, the long-awaited warmth brings out the inner gardener. Gardening is a great way to clear the mind and find your inner peace -- while getting a free workout! The ACA reminds us to "Pull the Weeds, Not Your Back." Check out their website for helpful gardening tips. Happy planting! To all our moms a very Happy Mother's Day and to the men and women who serve our country, especially those who gave their lives, we say thank you and remember your sacrifice this Memorial Day. This month is dedicated to raising awareness of Celiac Disease, a digestive disorder affecting 1 in 33 Americans that is triggered by consuming gluten, a protein commonly found in breads, pastas, baked goods containing wheat, barley or rye. Untreated, Celiac Disease can damage the inner surface of the small intestine, causing malabsorption of certain nutrients that can rob the body of vital nutrients. While there is no known cure for Celiac Disease, avoiding gluten can help manage the disease and prevent complications. If you think you may be experiencing Celiac symptoms, a simple blood test can indicate whether you have a gluten sensitivity. A gluten-free diet can relieve symptoms as well as help your body recover from damage done to the intestinal lining. Dr. Reynolds specializes in gluten-free living and can help you transition to your new lifestyle. Procrastination, forgetfulness, a propensity to lose things, unable to pay attention - sounds a lot like ADHD. However, these symptoms very well could be a sleep disorder in disguise. If you're not spending enough time in "delta" sleep, your body is not getting the restorative sleep it needs to function properly. Before seeking a diagnosis for an attention deficit problem, review your sleep patterns. How many hours of shut eye are you getting? Do you have difficulty falling and staying asleep? Do you feel refreshed upon waking? Are you tired during the day? If you are suffering from insomnia or sleep disturbances, BrainCore neurofeedback therapy can help regulate abnormal brain-wave patterns that underlie brain fog, sleep and memory issues and other symptoms that mimic ADHD. Call us to schedule a consultation. An explanation of "brain-wave dysregulation"
The benefits of using BrainCore Therapy in a multimodal therapy plan. Seating is very limited. Please call for details: 631.265.1223. Food allergy is the leading cause of severe allergic reactions (anaphylaxis) outside of the hospital setting in the U.S., causing about 50,000 to 125,000 emergency room visits per year. Teens and young adults with peanut or tree nut allergy and asthma appear to be at greater risk for severe or fatal allergic reactions. Did you know that food allergies or sensitivities can also trigger emotional and behavioral issues like attention disorders? Traditional laboratory bloodwork can reveal specific food allergies. However, oftentimes lab reports come back negative for a true "allergy." If this is the case, a food "sensitivity" may be triggering symptoms. ALCAT testing can identify cellular reactions to over 350 foods, chemicals and herbs that are linked to a host of disorders like migraines, diabetes, skin, digestive and heart issues. This month we're offering $50 off the ALCAT. Call us to learn more. Physical exercise can turn on the brain's ability to grow and rewire itself, a unique capability called "neuroplasticity." Some exercises are better than others and, as it turns out, dance is ideal for warding off dementia. Check out Dr. Chiappino's recent article in Forty Forward to learn how physical and mental exercise and neurofeedback therapy can give you a jump-start to maintaining good brain balance and neuroplasticity that will keep you young at heart, body and mind. Missed Dr. Chiappino's Autism Teleseminar? If you missed last month's Autism and BrainCore therapy lecture, you can catch Dr. Chiappino's informative teleseminar on the New Life Wellness Center website. Click here to access the audio file. May 21 -- Melville Marriott. Dr. Brent Reynolds presents an insightful lecture on BrainCore Therapy. Call 631.265.1223 for more info. Purchase your gift certificate for Mom today. Mother's Day is May 12. 631.265.1223.